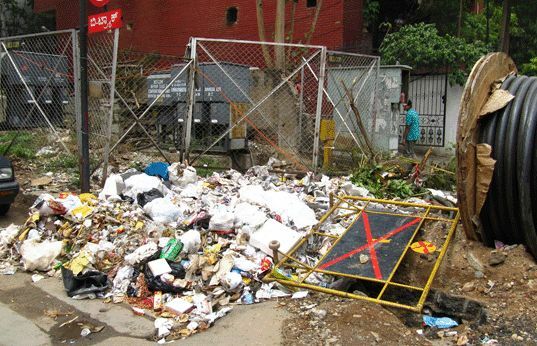 This open garbage dump sits at a prominent intersection on prime land. It’s like this everyday – in plain sight of some of India’s leading companies. Thousands of executives walk past this mess on their way to work. Many add their contribution. Nobody seems to mind. Or if they do, they don’t want to do anything about it. These companies are celebrated globally for leading India’s economic growth. Yet, the dump outside their offices isn’t a cause for concern. Nobody seems sure who dumps here. Everyone we ask claims innocence and points to someone else. Our observation shows that all are guilty. Nobody objects, so the habit persists. It’s appalling. And so typical.